Cresyl Diphenyl Phosphate - ZhangJia Gang YaRui Chemical Co., Ltd. Appearance: Colorless Transparent Liquid, Soluble In Organic Solvents, Slightly Soluble In Water. Raw Materials: Through The Raw Materials Of Cresol, Phenol, Phosphorus Oxychloride. This Product Is Flame Retardant Plasticizer, And Resin Compatibility, For Polyvinyl Acetal, Nitrocellulose, Polyvinyl Chloride, Natural Rubber And Synthetic Rubber; Can Also Be Used For Synthetic Lubricants And Hydraulic Oil; Substitutes For Triphenyl Phosphate. Applicable To Polyvinyl Chloride, Vinyl Chloride Copolymer, Polyvinyl Acetal, Nitrocellulose, Ethyl Cellulose, Cellulose Acetate Butyrate And So On. (1) Mixing M-Cresol And Molten Phenol, And Then Adding Calcium And Magnesium Catalyst; When The Temperature Is Less Than 50 ℃, Adding Phosphorus Oxychloride, The Mixture; The Mixture And Then Pressure Row Acid, Negative Pressure Row Acid, The Negative Pressure Distillation Separation, Vacuum System Vacuum ≥ 0.0983Mpa, Collecting The Temperature Of The Fraction At 290 ~ 310 ℃ When The Resulting Fractions, Measured The Acid Value ≤ 0.15mgKOH / G, That Is, Toluene Diphenyl Phosphate. The Production Process Is Simple And The Cost Is Low. 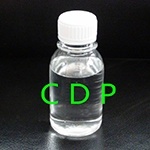 The Prepared Toluene Diphenyl Phosphate (Flame Retardant CDP) Conforms To The Standard Of Toluene Diphenyl Phosphate (Flame Retardant CDP), The Yield Is Over 88%, Plasticizer, And Has Good Compatibility, Electrical Insulation, Good Hydrolytic Stability, High Plasticizing Efficiency, Good Wear Resistance Of The Products; Can Be Used In Polyvinyl Chloride, Vinyl Chloride Copolymer, Polyvinyl Alcohol Shrink Aldehydes, Nitrocellulose, Cellulose Acetate, Butyl Acetate Cellulose, Cellulose Resins, Natural And Synthetic Rubbers, And The Like. Status Of Goods: Exports Of Category 6 Dangerous Goods. Toluene Diphenyl Phosphate Flame Retardant CDP Raw Materials: Cresol, Phenol, Phosphorus Oxychloride.